Crochet flower patterns, detailed easy to follow video tutorials, crochet bell flower, crochet and knitting flowers for beginners and skilled masters. This incredibly beautiful life-looking crochet bell flower pattern is suitable for intermediate level of crocheted skills. We begin to crochet the body of the flower working in rows and once we have made 5 petals we join the first and the last petal together to form the bell flower. The body of the flower has ribs made of slip stitches which make the flower look like the real one. 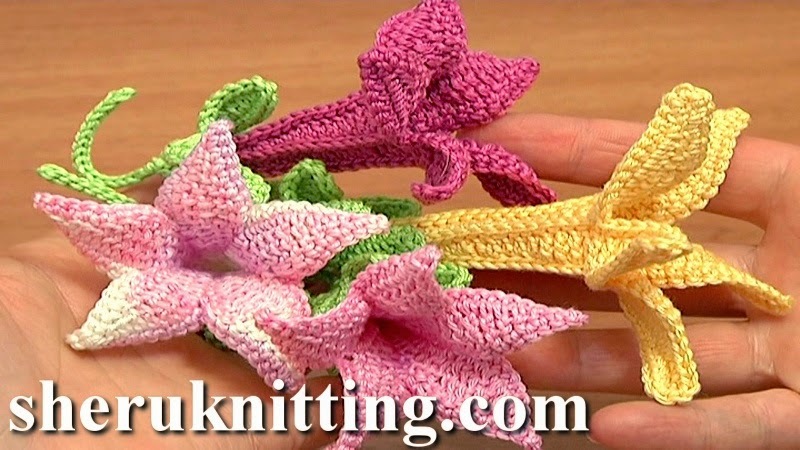 In the second part of crochet flower tutorial 71 we will continue the work and crochet sepals and a leafstalk. Please continue following the next tutroial. Thanks for watching!